Very infrequently do I have an excuse to use every color on my palette, but when I do I don’t hesitate. 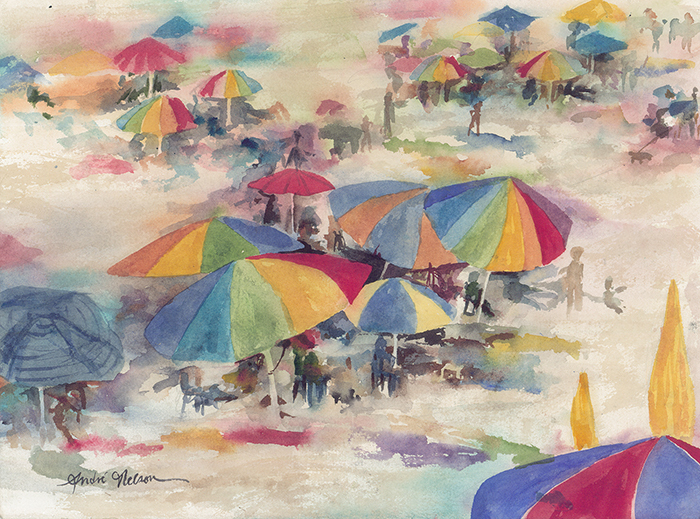 The umbrellas on the beach were rarely one color and usually all of them. This painting is an original compilation of many different bunches of umbrellas I saw throughout the summer and is decidedly more abstract than most of my work. Notice the very undefined shapes underneath the umbrellas that just barely pass as people, chairs and coolers when viewed from afar. This is a relatively new technique for me that I’m enjoying: using simple strokes and shapes to suggest figures and objects and letting the viewer’s mind fill in the gaps.